I finally have internet again -- yay!! Which means it is time to catch up on posts here. Thankfully I was diligent in my note keeping and wrote down which polish I had used before putting them away.. although right now my desk does resemble the aftermath of a tornado.. I try, I really do. Polka dot nails are my favourite thing.. well.. many different types of nails are my favourite, but dots do rank right up there. 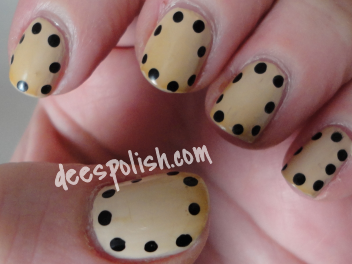 I decided to just do simple framed dot nails for this day of the #31DC2014.. because.. well, why not? They are simple and classy. Though my polish, at the tips, took some weird transformation.. you'll see in the photos! I don't know whether it looks gross or kind of neat.. maybe a bit of both? I used OPI You're So Vain-illa and FxFS Dark matter and a dotting tool. That is all for day 11.. have to get a wealth of other posts up yet.